Cook the potatoes in water until a knife can be inserted into the potato flesh. Cut the tomatoes in small dice, add the chopped chives, the juice of half a lemon and olive oil. Season with salt and pepper and set aside. Cook the Romanesco broccoli in salted boiling water; it should remain crisp. Sauté the golden chanterelles with butter and a chopped shallot. Cook the fillets of John Dory with a generous pat of butter and some olive oil. Baste the fish frequently for 4-5 minutes. 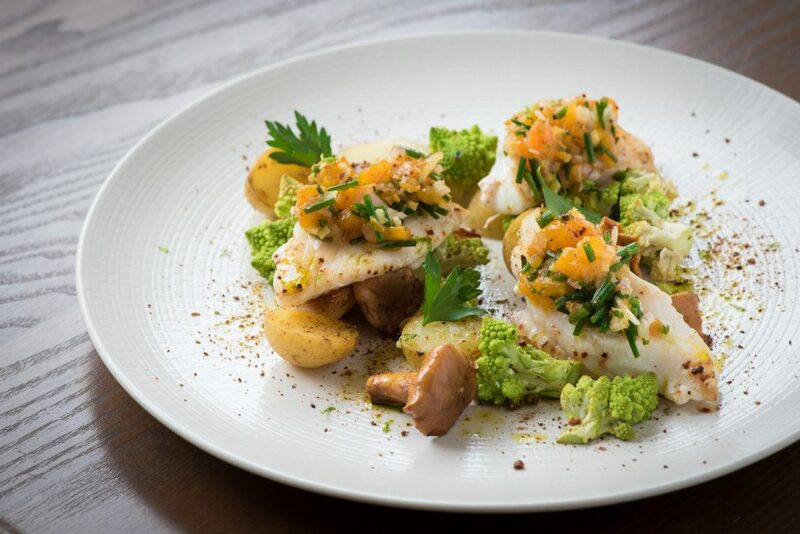 Arrange the fillets of John Dory, the potatoes, the golden chanterelles and the Romanesco broccoli on a plate in a “deconstructed” fashion. Pour the tomato salsa on the fillets just before serving.